This article was originally published on the Great Transition Initiative web site here. Republished here with permission from the author. The “sharing economy” has attracted a great deal of attention in recent months. Platforms such as Airbnb and Uber are experiencing explosive growth, which, in turn, has led to regulatory and political battles. Boosters claim the new technologies will yield utopian outcomes—empowerment of ordinary people, efficiency, and even lower carbon footprints. Critics denounce them for being about economic self-interest rather than sharing, and for being predatory and exploitative. Not surprisingly, the reality is more complex. This essay, based on more than three years of study of both non-profit and for-profit initiatives in the “sharing economy,” discusses what’s new and not so new about the sector and how the claims of proponents and critics stack up. While the for-profit companies may be “acting badly,” these new technologies of peer-to-peer economic activity are potentially powerful tools for building a social movement centered on genuine practices of sharing and cooperation in the production and consumption of goods and services. But achieving that potential will require democratizing the ownership and governance of the platforms. Earlier this year, hundreds of people gathered in a downtown San Francisco venue to celebrate—and debate—the “sharing economy.” The term covers a sprawling range of digital platforms and offline activities, from financially successful companies like Airbnb, a peer-to-peer lodging service, to smaller initiatives such as repair collectives and tool libraries. Many organizations have been eager to position themselves under the “big tent” of the sharing economy because of the positive symbolic meaning of sharing, the magnetism of innovative digital technologies, and the rapidly growing volume of sharing activity. While boosterism has been the rule in this sector, a strong contingent at the conference questioned whether the popular claim that the sharing economy is fairer, lower-carbon, and more transparent, participatory, and socially-connected is anything more than rhetoric for the large, monied players. Janelle Orsi, an activist lawyer, opened with a provocative challenge: “How are we going to harness the sharing economy to spread the wealth?” The Airbnbs of the world and their venture capitalist backers are siphoning off too much value, she and others argued. Discussions of labor exploitation, race to the bottom dynamics, perverse eco-impacts, unequal access for low-income and minority communities, and the status of regulation and taxation engaged attendees throughout the next two days. While many of the most visible platforms in the sharing economy began in the United States, sharing has become a global phenomenon, both because of the expansion of platforms to other countries, and because the idea of sharing has caught on around the world. Platforms are proliferating throughout Europe, where cities are becoming centers of “sharing” practices. Paris, for example, has become the annual home of the “OuiShare” fest. The Arab world has a raft of new sharing innovations, Colombia has become a sharing hub in Latin America, and Seoul is a center of sharing. Last year, the government of Ecuador launched Buen Conocer, an initiative to radically reimagine the nation according to principles of sharing—open networks, open production, and an economy of the commons. While the politics of these sharing efforts differ across the globe, what is common is the desire among participants to create fairer, more sustainable, and more socially connected societies. I became interested in the sharing economy in 2008 while I was writing a book about a transition to a small-scale, ecologically sustainable economy.2 At that time, I predicted a decline in full-time employment, as well as the need to reduce working hours as a method of controlling carbon emissions. I proposed a new household model in which people would have diverse sources of income, and would access goods and services through varied low-cost channels. With enough of a safety net and sufficient public goods, such a world could yield greater freedom, autonomy, and quality of life. If it were able to provide decent earnings and reasonably low prices, the sharing economy could be an important component of that new model. Today, however, with the corporatization of a number of the leading players, the role of the sharing economy in a just and sustainable transition is an open question. It is timely to step back and take stock of what has happened and how the arguments both for and against the sharing economy stack up. Because my research has focused on the United States, this essay will do so as well, returning to the global dimensions of sharing in the conclusion. I begin with a brief review of what the sharing economy is, where it came from, and why people are participating in it. I will then consider the sharing economy’s impacts on ecological well-being and social connection. I conclude with the question of whether these new technologies and practices can lead to new forms of organizing that may be part of a citizens movement for a fairer and more sustainable economy. Coming up with a solid definition of the sharing economy that reflects common usage is nearly impossible. There is great diversity among activities as well as baffling boundaries drawn by participants. TaskRabbit, an “errands” site, is often included, but Mechanical Turk (Amazon’s online labor market) is not. Airbnb is practically synonymous with the sharing economy, but traditional bed and breakfasts are left out. Lyft, a ride service company, claims to be in, but Uber, another ride service company, does not. Shouldn’t public libraries and parks count? When I posed these questions to a few sharing innovators, they were pragmatic, rather than analytical: self-definition by the platforms and the press defines who is in and who is out. Sharing economy activities fall into four broad categories: recirculation of goods, increased utilization of durable assets, exchange of services, and sharing of productive assets. The origins of the first date to 1995 with the founding of eBay and Craigslist, two marketplaces for recirculation of goods that are now firmly part of the mainstream consumer experience. These sites were propelled by nearly two decades of heavy acquisition of cheap imports that led to a proliferation of unwanted items.3 In addition, sophisticated software reduced the traditionally high transaction costs of secondary markets, and at eBay, reputational information on sellers was crowdsourced from buyers, thereby reducing the risks of transacting with strangers. By 2010, many similar sites had launched, including ThredUp and Threadflip for apparel, free exchange sites like Freecycle and Yerdle, and barter sites such as Swapstyle.com. Online exchange now includes “thick,” or dense, markets in apparel, books, and toys, as well as thinner markets for sporting equipment, furniture, and home goods. There has also been a revival of non-monetized initiatives such as tool libraries, which arose decades ago in in low-income communities. These efforts are typically neighborhood-based in order to enhance trust and minimize transportation costs for bulky items. New digital platforms include the sharing of durable goods as a component of neighborhood building (e.g., Share Some Sugar, Neighborgoods). These innovations can provide people with low-cost access to goods and space, and some offer opportunities to earn money, often to supplement regular income streams. The third practice is service exchange. Its origins lie in time banking, which, in the United States, began in the 1980s to provide opportunities for the unemployed.5 Time banks are community-based, non-profit multilateral barter sites in which services are traded on the basis of time spent, according to the principle that every member’s time is valued equally. In contrast to other platforms, time banks have not grown rapidly, in part because of the demanding nature of maintaining an equal trading ratio.6 There are also a number of monetized service exchanges, such as Task Rabbit and Zaarly, which pair users who need tasks done with people who do them, although these have encountered difficulties expanding as well. In what follows, I will use a number of terms, including providers, consumers, participants, and users. Consumers are those who are buying services, while providers, or suppliers, are offering them. Participants can be on either side of a transaction. Users is also often employed this way. For example, Airbnb calls hosts and guests users, but in other platforms, e.g., Lyft or Uber, users would be riders, rather than drivers. On the other hand, we have found in our research that quite a few people who are providers on a site also use it as consumers, so the distinction is often more useful for transactions than persons. The operation and the long-term impacts of these platforms are shaped by both their market orientation (for-profit vs. non-profit) and market structure (peer-to-peer vs. business-to-peer). These dimensions shape the platforms’ business models, logics of exchange, and potential for disrupting conventional businesses. Examples of each type are shown in Figure 1. While all sharing economy platforms effectively create “markets in sharing” by facilitating exchanges, the imperative for a platform to generate a profit influences how sharing takes place and how much revenue devolves to management and owners. For-profit platforms push for revenue and asset maximization. The most successful platforms—Airbnb and Uber, valued at $10 and $18 billion respectively— have strong backing from venture capitalists and are highly integrated into existing economic interests.8 The introduction of venture capitalists into the space has changed the dynamics of these initiatives, particularly by promoting more rapid expansion. While some of the platforms present a gentle face to the world, they can also be ruthless. Uber, which is backed by Google and Goldman Sachs, has been engaging in anti-competitive behavior, such as recruiting its competitors’ drivers. While its representatives articulate a neoliberal rhetoric about the virtue of “free markets,” the company is apparently hedging its bets on what “free” markets will deliver for it by hiring Obama campaign manager David Plouffe to bring some old-fashioned political capital to its defense. By contrast, many of the initiatives in the sharing space, such as tool libraries, seed banks, time banks, and food swaps, are non-profits. They do not seek growth or revenue maximization, but instead aim to serve needs, usually at a community scale. While the for-profit vs. non-profit divide is the most important one, the divide between P2P (peer-to-peer) and B2P (business-to-peer) platforms is also significant. P2P entities earn money by commissions on exchanges, so revenue growth depends on increasing the number of trades. In contrast, B2P platforms often seek to seek to maximize revenue per transaction, as traditional businesses often do. Consider the differences between Zipcar (B2P) and RelayRides (P2P). On RelayRides, owners earn income from renting their own vehicles, choosing trades based on their needs, and setting rates and availability. Zipcar functions like an ordinary short-term car rental company. With a P2P structure, as long as there is competition, the “peers” (both providers and consumers) should be able to capture a higher fraction of value. Of course, when there is little competition, the platform can extract rents, or excess profits, regardless. Motives for participating in the new sharing economy differ, which is not surprising given the diversity of platforms and activities. Some participants are drawn by the trendiness or novelty of the platforms. It is, however, important to recognize that the novelty about which many participants (and platforms) talk can be an expression of classism and racism. Sharing is not just a relic of pre-modern societies; such practices remain more common in working-class, poor, and minority communities. The discourse of novelty employs a false universalism that can be alienating to people who have maintained non-digital sharing practices in their daily lives. Beyond novelty and the pull of new technologies, participants tend to be motivated by economic, environmental, and social factors.10 Sharing economy sites are generally lower in cost than market alternatives. Particularly with P2P sites, value can be redistributed across the supply chain to producers and consumers and away from “middlemen,” in part because producers’ costs are lower. An Airbnb host, for example, can deliver a room more cheaply than a hotel. The platforms’ fees are also lower than what established businesses extract in profits. (Airbnb’s maximum fee is 15%.) Service and labor exchange platforms, whether they are time banks or for-profit platforms like Task Rabbit, extract far less value than traditional agencies that arrange child care, concierge services, or home health care aides. The platforms also allow people to earn money in ways that had not previously been safely or easily available. Many sites advertise themselves as green and present sharing as a way to reduce carbon footprints. It is a truism among “sharers” that sharing is less resource intensive than the dominant ways of accessing goods and services (e.g., hotels, taxis, shopping malls) because of the assumed reduction in demand for new goods or facilities. The actual environmental impacts of the sites are far more complicated, however, as will be discussed in the following section. Finally, a commitment to social transformation is an important motivator. My Connected Consumption Research Team has found that many respondents emphasize the value of sharing and collaboration, and some are highly critical of capitalism, the operation of the market, and the business-as-usual economy.12 Ideological motivation, however, varies by site, with less exhibited by earners on platforms such as Airbnb and RelayRides and more by participants in time banks and food swaps. How Green is the Sharing Economy? Most sharing economy websites advertise their green credentials, and many users care about their ecological impact. The ecological benefits of sharing are often seen as obvious: secondary markets reduce demand for new goods, so footprints go down. Staying in existing homes reduces the demand for new hotels just as toolsharing reduces new tool purchases. However, despite the widespread belief that the sector helps to reduce carbon emissions, there are almost no comprehensive studies of its impact. At this point, they are long overdue. An exception is a recent study of carsharing.13 It found a measurable reduction in greenhouse gas emissions, but only because of substantial reductions from a small fraction of households. For the majority, carsharing, by expanding access to cars, increased emissions. The ordinary assumptions about ecological impacts are generally about the first, visible shifts made by a consumer—purchasing used products rather than new ones, or staying in a private home rather than a hotel. To assess overall ecological impacts, however, we have to consider ripple effects. What does the seller or the host do with the money earned? She may use the money to buy high-impact products. Does the appearance of a market for used goods lead people to buy more new things that they intend to sell later? If travel becomes less expensive, do people do more of it? All of these effects raise ecological and carbon footprints. There is also the question of impacts at the level of the economy as a whole. The platforms are creating new markets that expand the volume of commerce and boost purchasing power. The larger, for-profit companies are claiming to generate substantial business and income for their providers. If so, they are likely creating economic activity that would not have existed otherwise—more travel, more private automobile rides—and not just shifting purchasing from one type of provider to another. My students and I have found that Airbnb users are taking more trips now and that the availablity of cheap ride services is diverting some people from public transportation. That means the platforms result in higher carbon emissions, because their services use energy. The companies can’t have it both ways—creating new economic activity and reducing carbon emissions—because the two are closely linked. Does the Sharing Economy Build Social Capital? While the discourse of novelty in this sector is overrated, there is something new afoot: what I call “stranger sharing.” Although there are exceptions (e.g., elite travelers in ancient Greece), people have historically limited sharing to within their own social networks. Today’s sharing platforms facilitate sharing among people who do not know each other and who do not have friends or connections in common. Stranger sharing entails higher degrees of risk, and many of today’s exchanges are quite intimate—sharing one’s home or car, going into strangers’ homes to do work, or eating food prepared by unknown cooks. The platforms reduce risk by posting information on users via feedback and ratings. This points to a second novel dimension—the use of digital technology to reduce transactions costs, create opportunities in real time, and crowdsource information. The uniqueness of this new sharing economy is that it mobilizes technology, markets, and the “wisdom of crowds” to bring strangers together. The role of ratings and reputational information is at the center of questions about social capital. 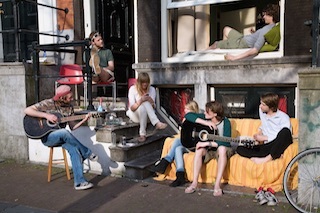 The conventional wisdom is that the provision of crowdsourced information on users is what leads people to feel safe about interacting in intimate ways with strangers.16 Parigi’s research, however, uncovered a paradox: the more reputational information the site provided about people, the less users formed strong bonds. Venturing into unknown territory with strangers may be more of the appeal of some sites than their ability to master a utilitarian calculus of risk and reward. The debut of the sharing economy was marked by plenty of language about doing good, building social connections, saving the environment, and providing economic benefits to ordinary people. It was a feel-good story in which technological and economic innovation ushered in a better economic model. Especially in the aftermath of the financial crash, this positive narrative was hard to resist. Social activists flocked to these initiatives, hoping to piggyback on their popularity. Maybe, they thought, digital P2P platforms could be a pathway to a true grassroots, inclusive, fair, and lowimpact economy. The central theme of the critics is that for-profit platforms have coopted what began as a progressive, socially transformative idea. Are they right? Regarding regulation, insurance, and taxation, the platforms are mobilizing political support, and, my experience suggests that they seem to be generally accepting of the idea that some regulation is necessary. Because most of the action is at the local and state level, there is a great deal of variation. But the trend seems to be towards a light regulatory touch that will allow the platforms to operate and grow. Part of the difficulty in assessing the impact of these new earning opportunities is that they are being introduced during a period of high unemployment and rapid labor market restructuring. Working conditions and protections are already being eroded, real wages are declining, and labor’s share of national income in the US has declined to historic lows. If the labor market continues to worsen for workers, their conditions will continue to erode, and it will not be because of sharing opportunities. Alternatively, if labor markets improve, sharers can demand more of the platforms because they have better alternatives. The two effects will work in opposite directions: with destruction of demand for legacy businesses and growth for sharing companies. We also need to consider the diversity of industries in which sharing platforms are operating. Some sectors are characterized by high rents that are easy to capture with disruptive technologies. Consider taxis. The biggest impact is likely the erosion in the value of medallions, the licenses they must possess to operate, because these medallions yield pure rents. While drivers in conventional operations may be capturing some of this excess profit, they are already facing adverse market conditions and, in many places, earning low hourly wages, as they are forced to pay high leasing and other fees to the owners of the medallions and vehicles. Union members fare better, but could they do better with Uber? Many have switched in hopes that they can. So far, though, the results are mixed, in part because they face increasing competition from platforms like UberX and Lyft, on which drivers use their own cars. And early high returns have been reduced by Uber’s fare cuts, which have led to driver protests and organizing efforts. An online platform with a good rating system should improve labor conditions. Consider the market for home health aides, where agencies currently take an enormous fraction of hourly fees, sometimes more than half.23 A P2P matching platform would take a lower fraction, enabling low-paid workers to earn considerably more and have more autonomy over which jobs they accept. Where owners, agencies, or other actors are extracting rents, P2P platforms should do what they claim—distribute value to consumers and producers and away from gatekeepers and rent extractors. Ultimately, the question is about how much value providers on these platforms can capture. This depends partly on whether they can organize themselves, a question the next section will explore. But there is another dimension, which is whether there is competition among platforms. Will they come to monopolize a given space, as we have seen in the areas of search, social media, and retail (Google, Facebook, Amazon)? Or are these P2P enterprises different? What they are offering is software, insurance, ratings, and a critical mass of participants. These are functions that can be replicated. For example, if the volume of users continues to grow, then critical mass may be achievable on multiple platforms. The ratings systems are not yet very good, and there are already start-ups attempting to delink ratings from individual platforms. Insurance can also be unbundled. At the May conference, venture capitalist Brad Burnham predicted a coming round of cost-squeezing akin to the cost-squeezing that the start-ups are inflicting on legacy businesses. On the other hand, the more the platforms are backed by and integrated with the large corporations that dominate the economy, the more monopolized the sector will be, and the less likely value will flow to providers and consumers. Airbnb has begun to encourage its users to organize. In 2013, the global head of “community” at the company co-founded Peers.org, an attempt to build a social movement of sharers. Not long after, Airbnb created its own organizing platform for guests, hosts, and employees, which has led to the creation of numerous local groups of users who are coming together on and offline for a variety of purposes, including sharing advice and affecting public policy. The company wants these groups to push for favorable regulation. But they may develop agendas of their own, including making demands of the company itself, such as setting price floors for providers, pushing risk back onto the platforms, or reducing excessive returns to the entrepreneurs and the venture capitalists. On the labor exchanges, where the need for organization is perhaps most acute, providers could push for minimum wages. Existing platforms could also potentially become user-governed or cooperatively owned, an outcome some voices within the community are advocating. The platforms’ discourse borrows heavily from the peer production world and emphasizes the ability of these technologies to empower ordinary individuals. As many online communities have shown, the online environment can be conducive to organizing against unpopular policies, software changes, and practices. The fact that users create so much of the value in these spaces militates in favor of their being able to capture it, should they organize to do so. To date, that type of movement has not developed, but it still might. Alternately, organizations that are part of the solidarity sector, such as unions, churches, civil society groups, and cooperatives, could create platforms for their members. They could build alternatives to the for-profits, particularly if the software to operate these exchanges is not too expensive. These platforms could be usergoverned and/or owned. For example, a taxi cooperative in Portland, Oregon, has adopted the technology used by ride sharing companies and will effectively morph into a driver-owned Lyft or Uber. In general, mounting a competitive challenge to business-as-usual should be easier when production is P2P because the platform is a broker, not a producer. This is one of the reasons the sharing platforms have grown so rapidly, while efforts to create worker cooperatives have yielded so few new enterprises and jobs. In the end, though, it is not just about economics. The key to making sharing economies socially just is to emphasize an explicit politics of sharing, as well as nurturing collective, public forms of sharing. So what are we to make of the sharing economy? There is little doubt that the prosharing discourse is blind to the dark side of these innovations. At the same time, the critics are too cynical. There is potential in this sector for creating new businesses that allocate value more fairly, that are more democratically organized, that reduce eco-footprints, and that can bring people together in new ways. That is why there has been so much excitement about the sharing economy. The emergence of P2P communities that share goods, space, and labor services can be the foundation of a new household model in which people are less dependent on employers and more able to diversify their access to income, goods, and services. But the early stage goodwill from the big platforms will dissipate as they become incorporated into the business-as-usual economy. We are at a critical juncture in which users’ organizing for fair treatment, demands for eco-accountability, and attention to whether human connections are strengthened through these technologies can make a critical difference in realizing the potential of the sharing model. There is an enormous amount of new economic value being created in this space. It is imperative that it flow equitably to all participants. After all, that is what we ordinarily call sharing. Ultimately, the ability of the new sharing practices to help catalyze a social transition may also depend on the form these initiatives take around the world. As the sharing economy expands in Europe, its practices are likely to be embedded in political, regulatory, and social contexts which are more attuned to the stated values of fairness, sustainability, openness, and cooperation. In Latin America, the leftward shift toward social solidarity, poverty alleviation, and democracy also suggests a context more conducive to a cooperative and community-oriented sharing movement, as we have seen in Ecuador. For those of us in countries where the pressures to commodify and concentrate value from these platforms are most intense, these developments can reveal possibilities. Outside the US, the impetus to share in transportation, housing, foods, and goods is more integrally tied to city-level goals of carbon emission reduction, informational transparency and genuine democracy. By embedding sharing practices within those larger municipal level movements, the likelihood that the sharing movement can achieve its stated goals is greater. My hunch is that the more that US sharing activists connect with other sharers around the globe, the more success we will have in pushing the goals of eco-accountability, value distribution, and social solidarity. This also means an openness to and ideally connection with other social movements that are already active on these issues. Ultimately, a cross-fertilization could both create accountability for the sharing platforms and organizations and embed sharing practices and cooperative economic activity into the DNA of the social movements. The sharing economy has been propelled by exciting new technologies. The ease with which individuals, even strangers, can now connect, exchange, share information, and cooperate is truly transformative. That’s the promise of the sharing platforms about which virtually everyone agrees. But technologies are only as good as the political and social context in which they are employed. Software, crowdsourcing, and the information commons give us powerful tools for building social solidarity, democracy, and sustainability. Now our task is to build a movement to harness that power. 1. Over the past three years, I have been conducting qualitative research on the sharing economy funded by the MacArthur Foundation (http://clrn.dmlhub.net/projects/connected-consumption). My research team has conducted seven cases: three non-profits (a time bank, a food swap, and maker-space), three for-profits (Airbnb, RelayRides, and Task Rabbit), and one hybrid (open-access education). We have done more than 150 interviews and more than 500 hours of participant observation. 2. Juliet B. Schor, True Wealth: How and Why Millions of Americans Are Creating a Time-rich, Ecologically-light, Small-scale, High-satisfaction Economy (New York: The Penguin Press 2011). 4. Ryan Lawler, “Airbnb Tops 10 Million Guest Stays Since Launch, Now Has 550,000 Properties Listed Worldwide,” December 19, 2013, http://techcrunch.com/2013/12/19/airbnb-10m/. 5. Edgar Cahn and Jonathan Rowe, Time Dollars (Emmaus, PA: Rodale Press, 1992). 6. Emilie Dubois, Juliet Schor, and Lindsey Carfagna,“New Cultures of Connection in a Boston Time Bank,” in Practicing Plenitude, eds. Juliet B. Schor and Craig J. Thompson (New Haven: Yale University Press, 2014). 7. It is worth noting the historical and global connections between the sharing platforms and other types of P2P activity. The collaborative software movement, which harnesses the unpaid work of software engineers to write code and solve problems collectively, paved the way for file-sharing, video posting, and crowdsourcing information, as seen in Wikipedia or citizen science. The global “commons” movement is encouraging peer production and the information commons, as well as the protection of ecological commons. 8. Andrew Ross Sorkin, “Why Uber Might Well be Worth $18 Billion,” New York Times, June 9, 2014, http:// dealbook.nytimes.com/2014/06/09/how-uber-pulls-in-billions-all-via-iphone/; Evelyn Rusli, Douglas MacMillan, and Mike Spector, “Airbnb Is in Advanced Talks to Raise Funds at a $10 Billion Valuation,” Wall Street Journal, March 21, 2014, http://online.wsj.com/news/articles/SB10001424052702303802104579451022670668410. 9. For more on sharing and public goods, see Julian Ageyman, Duncan McLaren, and Adrianne Schaefer-Borrego, “Sharing Cities,” Briefing for the Friends of the Earth Big Ideas Project, September 2013, http://www.foe.co.uk/sites/default/files/downloads/agyeman_sharing_cities.pdf. 10. Technophilia also spurs participation. People enjoy the sophisticated interfaces offered by many sites and like using the internet to do things quickly and easily. Many users have been “digitally primed” by years of sharing files or contributing information online. 11. Anny Fenton, “Making Markets Personal: Exploring Market Construction at the Micro Level in the Car-sharing and Time Bank Markets,” Unpublished paper, Harvard University, 2013. 12. Dubois, Schor, and Carfagna, op. cit. 13. Elliott W. Martin and Susan A. Shaheen, Greenhouse Gas Impacts of Car Sharing in North America, Mineta Transportation Institute Report 09-11 (San Jose, CA: Mineta Transportation Institute, 2010). 14. Paolo Parigi and Bogdan State, “Disenchanting the World: The Impact of Technology on Relationships,” Unpublished paper, Stanford University, n.d.
15. Dubois, Schor, and Carfagna, op. cit. ; Fenton, op. cit. 16. Recent studies have found inaccuracies in ratings systems, especially the tendency to overrate positive features and under-report bad experiences. A colleague and I review recent studies in Juliet B. Schor and Connor Fitzmaurice, “Collaborating and Connecting: The Emergence of a Sharing Economy,” in Handbook on Research on Sustainable Consumption, eds. Lucia Reisch and John Thogersen (Cheltenham, UK: Edward Elgar), 2015. 17. Juliet B. Schor et al., “Paradoxes of Openness and Distinction in the Sharing Economy,” Unpublished paper, Boston College, 2014. 18. Benjamin Hardin and Michael Luca, “Digital Discrimination: The Case of Airbnb,” Harvard Business School Working Papers, 2014. 19. Dean Baker, “Don’t Buy the ‘Sharing Economy’ Hype: Aibnb and Uber Are Facilitating Ripoffs,” The Guardian, May 27, 2014, http://www.theguardian.com/commentisfree/2014/may/27/airbnb-uber-taxes-regulation. 20. Anthony Kalamar, “Sharewashing is the New Greenwashing,” OpEd News, May 13, 2013, http://www.opednews.com/articles/Sharewashing-is-the-New-Gr-by-Anthony-Kalamar-130513-834.html. 21. Tom Slee, “Sharing and Caring,” Jacobin Magazine, January 24, 2014, https://www.jacobinmag. com/2014/01/sharing-and-caring/. 22. Kevin Roose, “The Sharing Economy Isn’t About Trust, It’s About Desperation,” New York Magazine, April 24, 2014, http://nymag.com/daily/intelligencer/2014/04/sharing-economy-is-about-desperation.html. 23. Jane Gross, “Home Health Aides: What They Make, What They Cost,” New York Times, December 30, 2008, http://newoldage.blogs.nytimes.com/2008/12/30/home-health-aides-what-they-make-what-they-cost/. 24. Uber and Lyft drivers have begun unionization efforts in various cities. Union representatives were at the San Francisco conference, and unionization has emerged as a topic of conversation among sharing innovators. This year, the National Freelancers’ Union opened a benefits desk offering insurance, 401(k) plans and other benefits for “independent” laborers in a variety of companies, including Lyft. Juliet Schor is Professor of Sociology at Boston College and is currently serving as the Matina S. Horner Distinguished Visiting Professor at the Radcliffe Institute, Harvard University. Her current research topics include consumer culture, sustainable lifestyles, and the relationship between time use and carbon emissions. She is a member of the MacArthur Foundation Connected Learning Research Network for which she is leading a six-year project on the sharing economy.